Installing the Smart Lock Pro is, as you might expect, a lot more involved than than your average smarthome accessory. First off you need the correct kind of deadbolt, compatible with an included mounting plate and adapters. Then you'll have to unscrew and completely replace your existing thumblatch, which thankfully shouldn't take any longer than 15 minutes, assuming you don't fall into one of a few exceptions which require extra steps and parts. The August Home iPhone app is pretty good at guiding users through the standard procedure with step-by-step video clips. Another item to install is the DoorSense, which detects whether a door is open or closed, and not simply whether it's locked. You can mount it on a nearby surface or flush within a door —we opted for the former, since that was easier to do and the latter option leaves a pretty big hole even when it's practical. 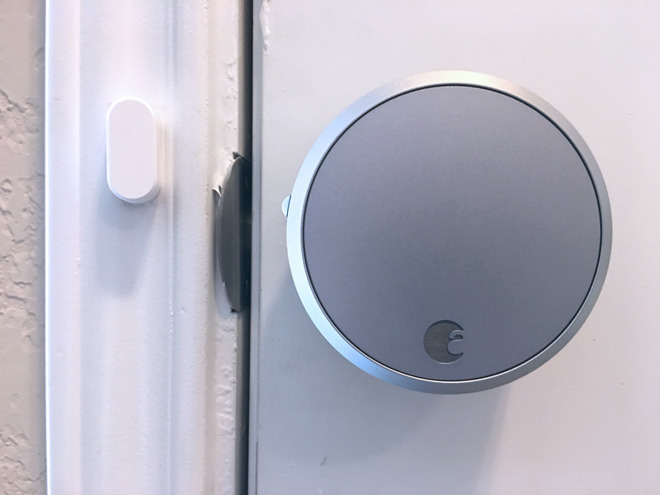 The Connect is a plug-mounted Wi-Fi bridge that's normally a paid add-on for other Smart Locks. This enables remote access, which is important not just for when you leave the house, but sometimes for when you're on the other side of it —it's relatively easy to wander outside of Bluetooth range. In fact we found it's essential for the Connect to sit relatively close to both the door and the Wi-Fi router, since a flaky connection will result in the app failing to see door status. 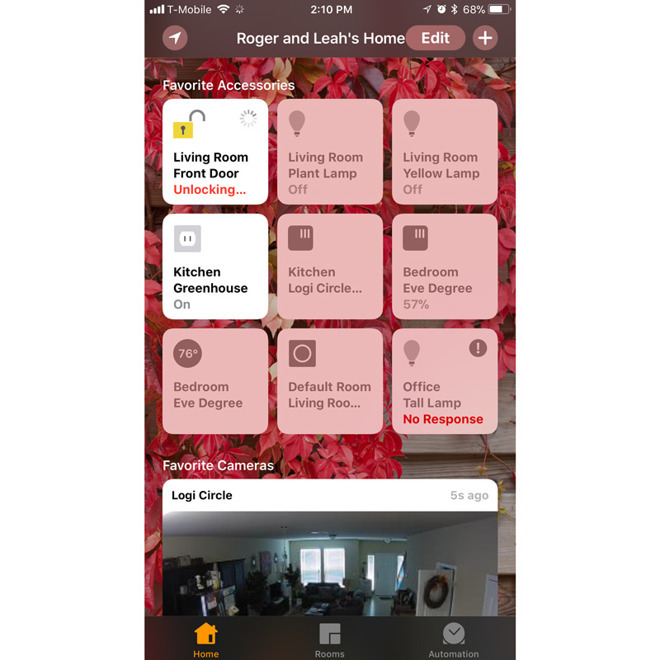 People invested in HomeKit will also need an Apple TV, iPad, or HomePod operating as a Home hub for remote use and automation. We'll get back to HomeKit in minute, but it's worth noting that many of the Pro's settings and controls are accessible only through August Home. You can assign co-owners and guests, check logs, and create temporary access keys, which is one reason August targets Airbnb and HomeAway. 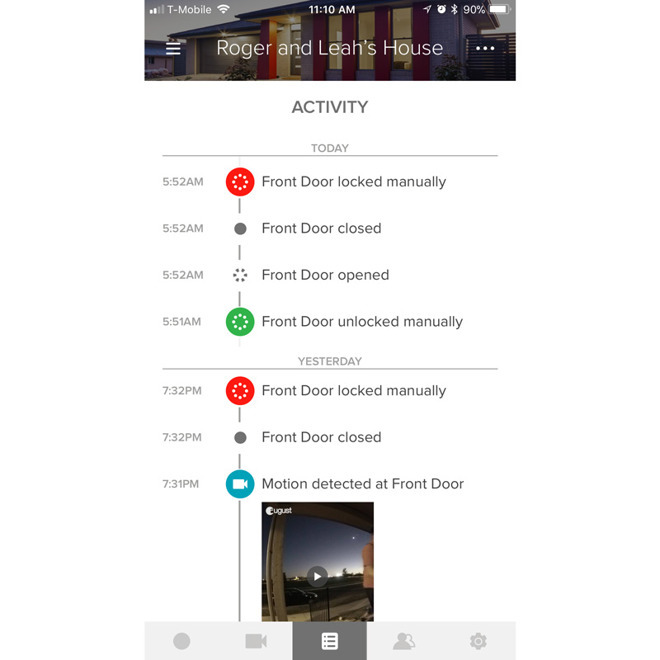 We tested the lock alongside August's Doorbell Cam Pro, which in that combination lets homeowners see and talk to visitors then unlock the door for them, all from the same part of the app. 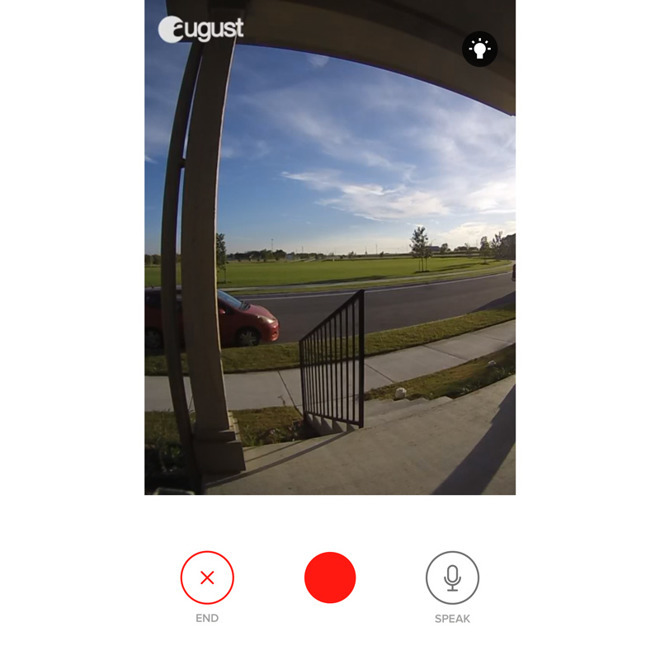 We felt the Doorbell Cam was actually the weakest part of the equation —it was relatively slow to trigger notifications, and video lagged a second or two behind. HomeKit compatibility is still unannounced, so you can't (yet) answer a ring and unlock the door from an iOS Home notification. We didn't have a chance to test the Pro with the $79 Smart Keypad, which may be a necessary add-on for people with kids or less technically-inclined guests. Physical keys will still work, of course. Perhaps the most important part of the app is actually its auto-lock and auto-unlock settings. You can set the former on a timer ranging from instant to 30 minutes, or disable auto-lock entirely —we went with 3 minutes, which seemed like ample time in most cases, including getting inside after auto-unlock. Instant is likely a terrible idea for obvious reasons. Auto-unlock may be the Pro's best feature. The lock can detect when you and and your iPhone have arrived home, letting you enter without fumbling for a device or keys. This proved very reliable at our test house, though we did have to leave our main key slot unlocked in order to waltz on in —we went back to fully locking up, just using the Pro to save a little time. Once a Pro is authenticated, Siri commands let owners control one or all equipped doors, and check status with questions like "Is the Front Door locked?" or "Are all my doors locked?" It's often faster to operate the Pro manually than talk to an iPhone or Apple Watch, mind. Our favorite automation involved adding the Pro to a "Good night" scene, which made sure our door was secure in addition to turning lights off. Some people might also enjoy using the lock as a conditional trigger, for instance turning lamps and fans on when coming home at night. You'd think geofenced automations would be the best use of HomeKit, but you'd (probably) be wrong. 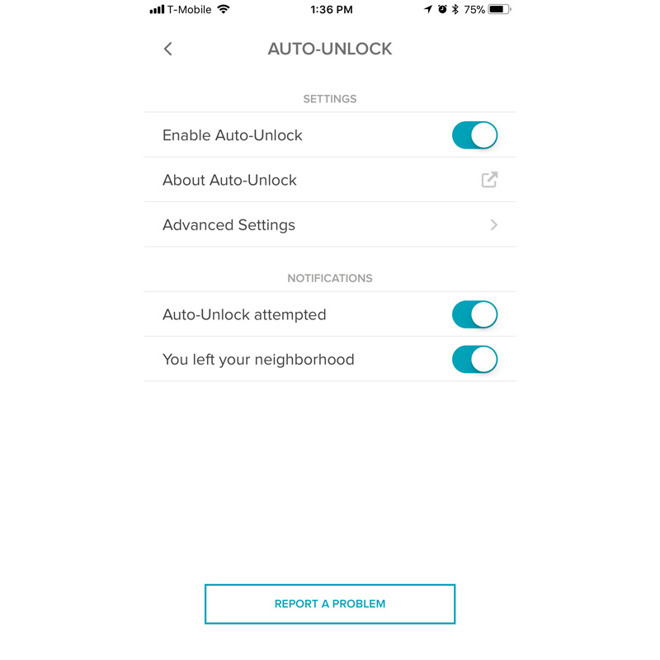 We tried setting up an exclusively location-based parallel of August's auto-lock/unlock routines, but the fact that the iOS Home app wouldn't run them without approval —when we were driving down the road, no less —made them useless. 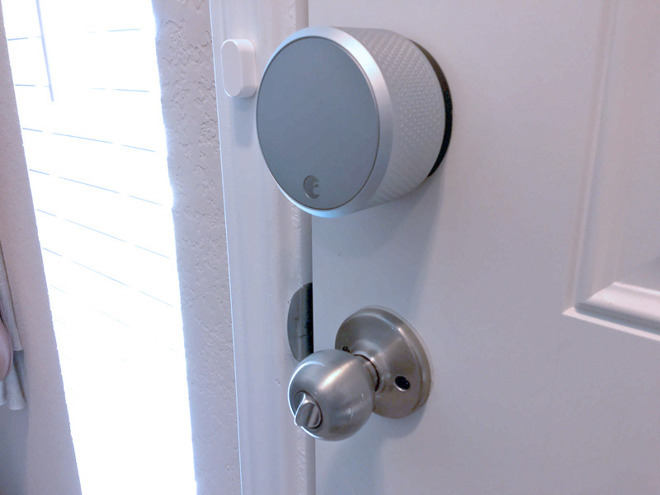 The Smart Lock Pro nevertheless proved a handy addition to our test home. Ultimately it was about peace of mind —while it's convenient to come and go without touching a key, the best thing was knowing for certain that our door was locked overnight or when we left for the gym. Depending on your needs, there are potentially better HomeKit-ready smartlocks on the market. The Smart Lock Pro + Connect will at least do the trick, however. Abt Electronics has the August Smart Lock Pro + Connect bundle in silver and dark grey for $279.00 with no sales tax collected on orders shipped outside IL, IN, MI and WI. Amazon and Best Buy also carry the Smart Lock Pro for $279.99 with free shipping, but both retailers collect sales tax in all applicable states.